The more I think about it, I prepped myself for this second hen. It started with a definite understanding that my French hen will have little eggs for Easter. And then my subconscious (call her the little devil on my shoulder) kept eyeing the other colors in the pattern and before I knew it all my ideas about eggs were scrambled into nothingness. I was dreaming about the endless possibilities that I could have with a pair. So I made up my mind (subconscious strike one) and decided that I will have two. Because it is going to be symmetrical, more balanced. Because they could be facing each-other and gossip their hearts out… oh, who am I kidding? I just wanted to make one more! Looking at the color combinations I decided to make the aqua and green one at the end. Primarily, because I wanted some harmony between the girls. I think incorporating this into the wreath will make the door ornament more balanced, more inviting. However, harmony comes in only the presence of some of the colors. I still wanted to make them unique. 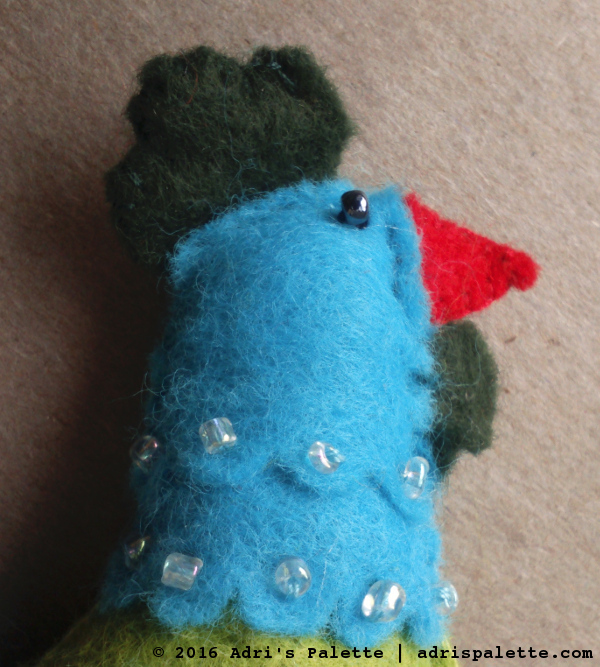 That is why I opted for this hen to have translucent sparkly beads as a necklace instead of the pearls. I really like how these do not take away rather direct the attention to the aqua colored neckline. For the wing embroidery I decided to take a simpler approach then for the previous one. I wanted to use only one color for the leaves, because I think the bird is colorful as it is. If the threads would be multi-colored, I felt it would be too much and take away the attention from the vibrancy of the hen itself. 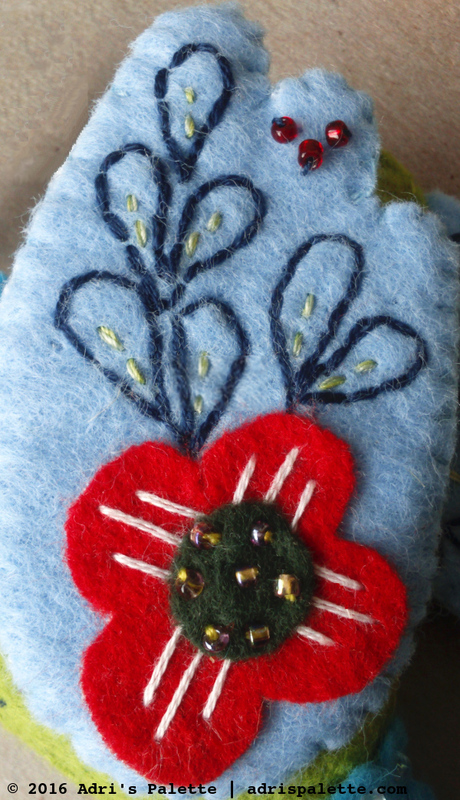 As the multi-colored embroidery works for the white and blue, so does the simplicity work for this one here. And talking about the vibrancy. 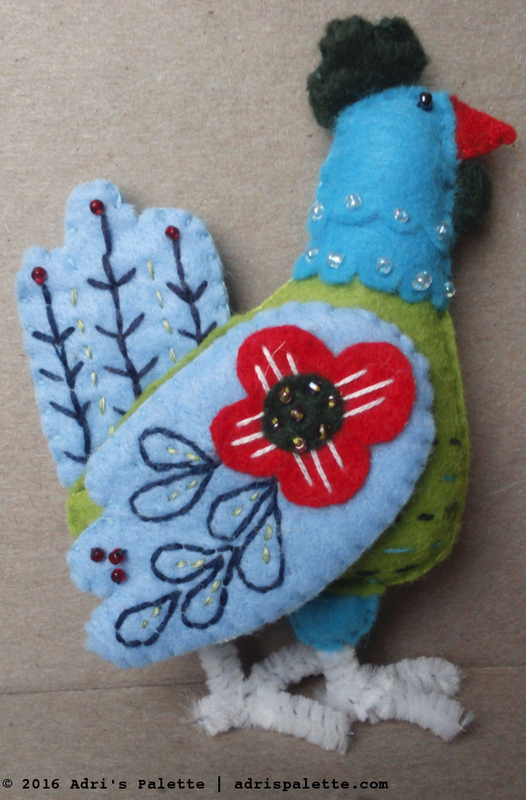 It took me a bit more time to get used to the color combination of this hen than to the white and blue one. Somehow the contrasts were more extreme, more out of place. Yet in the end I realized that no matter how weird it is, it is quite beautiful. And what is strange is that although they are just two, their presence is such that they make quite a pair!